Ever struggled to find a particular file on your Android mobile? Wish you could exert more control over your photos and other media, or uninstall more than one app at once? You need a file manager, and not just any file manager, but Tomi File Manager 1.4.2 at that. Tomi File Manager packs in lots of useful features, works with both internal and external storage and is far more than a simple tool for viewing files — plus, it’s free. Once fired up, Tomi File Manager provides you with a nifty pie chart of your amalgamated storage, color-coded for file type and offering handy shortcuts to key files, including media, apps, docs and downloads. Tap one for a context-sensitive view of its content: select Music and you can browse by songs, album, artist or year, for example, while videos are displayed sorted by date into timeline view. Tap an item to open or play it using an appropriate app — in the case of documents, you can view PDFs and Microsoft Office files within the app itself. Multiple items can be selected at once using tick boxes for performing bulk operations, such as copying, deleting, sharing, moving, renaming and even compressing. In the case of apps, you can uninstall multiple apps in one go. Downloads can be managed more effectively through Tomi too, with options for creating personal folders as well as backing up API files. And if that’s not enough, tap Directory to select a storage device or use a crumbs-based tool to go right to any folder on your phone or tablet. Some handy features include being able to hide sensitive folders and files, or put favourite folders directly on your home screen. And if you’ve rooted your device, Tomi makes it easy to change file permissions, owner and group, edit the host file and go further. At the end of the day, if you want a file manager app for your Android device, this is the one to try first. 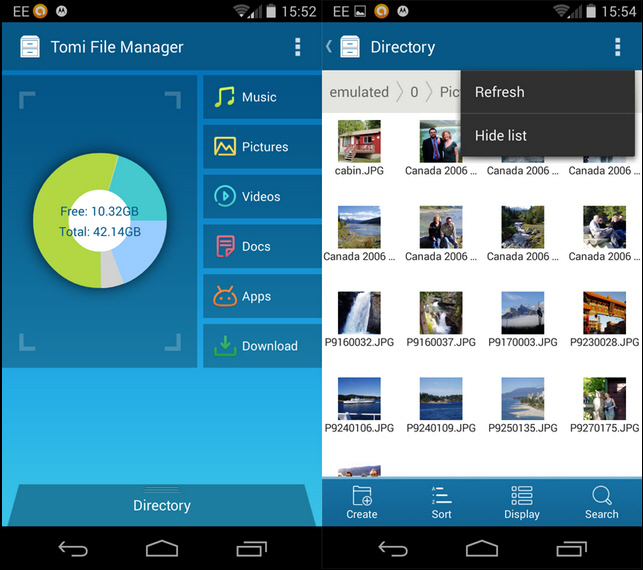 Tomi File Manager 1.4.2 is a free download for Android phones and tablets running Android 3.0 or later.